Home Criminal Law What Are Bail Bonds? When a person is arrested, they may have the opportunity to pay a sum of money to be released from police custody until their trial hearing. This payment is typically reimbursed once the defendant appears in court. This is called posting bail, and it ensures that the defendant will make an appearance at all of their future court hearings. The amount of the bail depends on several factors, most notably the severity of the crime and the defendant’s criminal record. If the crime is particularly severe, the defendant may be held without bail and will have to stay in jail until he or she goes to court. Ideally, people should be able to post bail themselves when they are arrested. For some people, however, this may not be an option. In some cases, the amount of the bail may be more than what the accused can afford. When this happens, the accused may have to get a bail bond. 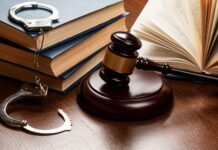 A bail bond is a written promise that states that a surety acting on the defendant’s behalf will cover the cost of the bail should the defendant fail to appear in court. This surety is referred to as a bail bondsman or a bail bond agent. In most cases, the defendant will need to cover part of the costs of the bail — usually around 10 percent — while the bail bondsman pays the rest. Bail bond agencies are usually open 24 hours a day, and they can often secure the release of a defendant within hours of an arrest. A defendant who has posted bail with the help of a bail bond is still required to appear for their trial hearing. Should the defendant fail to appear, the bail bond agency is permitted — by law or contractual obligation — to deliver them to the proper jurisdiction. These agencies often employ a bounty hunter for this purpose. Bail bond agencies are privately owned companies, and they usually charge non-refundable fees for their services. Many bail bond agencies require collateral from their clients to ensure that they can recover the money needed to post bail. These agencies are found almost exclusively in the United States, although there are bail bond agencies in the Philippines as well. Posting bail to be released from police custody is an option elsewhere in the world, but since bail is usually less expensive in other countries than it is in the U.S., there isn’t much need for bail bonds. Bail bond agencies are private businesses, and they serve an important purpose. A defendant’s ability to post bail, either by themselves or through a bail bond, can cut down on the overcrowding in U.S. prisons. If a defendant is unable to post bail, they must remain in custody until their trial hearing. This may take weeks and could be problematic if a defendant is being held in an overcrowded jail. Posting bail allows a defendant to go free (relatively speaking) while still providing a financial incentive to appear for a trial hearing. It may also allow defendants to provide for their families until they must appear in court. They remain in their own homes and live by their own means, which is beneficial for the defendants and law enforcement alike.